The new issue of PhotoPlus: The Canon Magazine is available now (as well as getting posted into subscribers' postboxes) and it’s a stacked issue. In the new December issue no. 146 on sale today, we’ll teach you all you need to know about taking awesome winter landscapes. Winter is a fantastic season for landscape photos, so brave the cold, as we teach you how to take great scenic shots using your Canon camera in our big skills guide. From aperture, shutter speed and ISO settings, we’ll also teach you to use the infamous Manual mode to control all three of these elements of the ‘exposure triangle’ separately for the best results. Also inside, our Apprentice learns how to take great photos around Bristol city with Canon pro Matt Parry – from modern to old architecture, from day to night. We interview the hugely successful fine-art photographer Gray Malin about his amazing aerial and arty commercial photos. In an exclusive, David Noton reveals what he really thinks about shooting with the new full-frame mirrorless EOS R camera and two RF lenses. In our Canon Skills section there are new photo projects and image-editing tutorials to follow: Recreate trench warfare using toy soldiers, a torch, a laser pointer and a touch of smoke; shoot stunning sunburst images to add special effects to your outdoor images; and get creative with shooting double exposures in-camera. All photo projects and image-editing tutorials come with free videos to follow along. In Canon School, we’ll teach you how to get more from your EOS DSLR by using the free software Canon available, plus our Brian answers more of your technical questions in EOS SOS. And last but not least – we test eight of the latest prime lenses for Canon full-frame and APS-C cameras, and much more. 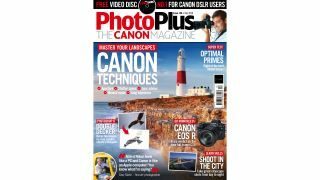 PhotoPlus: The Canon Magazine is 132 pages of essential Canon techniques, reviews, news and inspiration – out now at all good newsagents and supermarkets, or make sure of your copy every month by subscribing at our online shop from just £24.99 for six issues! PhotoPlus has a free weekly email newsletter that delivers 100% Canon-focused gear news, techniques and exclusive offers direct to your inbox every Tuesday. Sign up to get the PhotoPlus: The Canon Magazine email newsletter here.